Breckenridge Real Estate offers many options for Breckenridge Townhomes. 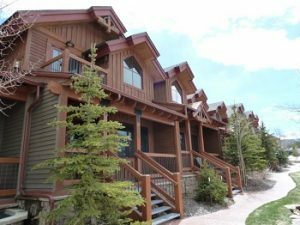 Whether it is a ski in/ski out luxury townhome in Mountain Thunder Lodge or an in-town Breckenridge Townhome in Placer Ridge Townhomes, or spacious townhome in Highland Greens Townhomes near the Breckenridge Golf Club, you will find exceptional townhomes for sale in Breckenridge. Contact us today to ask general questions about Breckenridge CO Real Estate or specific questions about Breckenridge townhomes you view on our website. What is the difference between a condo and a townhome? Condos have units above and/or below them whereas a townhome will have no units above or below. The only adjoining spaces for a townhome will be one or both side walls. Townhomes in Breckenridge tend to have less common amenities such as a pool, fitness room and usually have private hot tubs. Contact us today to ask general questions about Breckenridge CO Real Estate or specific questions about Breckenridge townhomes you view on our website.